Australians from “way Down Under” (Tasmania), Wendy Cocker and her husband Josh have enjoyed living in the Kingdom of Saudi Arabia for the past 14 years. Their extensive camping trips through the Kingdom have netted Wendy a multitude of images not seen by many ExPats. 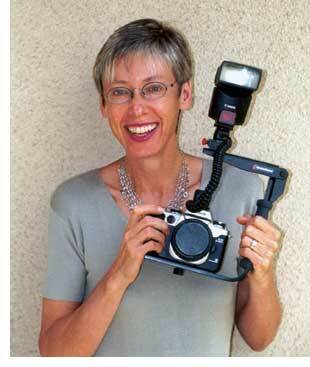 Until recently, Wendy worked at the Dhahran Hills School, which she regarded as “the best place to work in Aramco.” With camera constantly in hand, she has recorded the life of the school in the past 8 DHS yearbooks. When seen empty-handed, “Where’s your camera, Mrs. Cocker?” was a question frequently asked by the students. “401 Arabian Sights” grew out of themed sets of photos Wendy developed and sold since 1994. From memory joggers like "Things We'll Remember" to population centers (Dhahran and Al Khobar) to scenes across the country (Desert Life, Places and Faces), these images will twig the memories of former employees and annuitants, or serve as a “Show and Tell” for employees and students to show family and friends back home. Wendy’s latest project is "Barnaby of Arabia." It is the story of a cute, little, stuffed bear as he travels around Saudi.